Are you looking for an elevated cabin ? Is your hydraulic cab damaged ? Your hydraulic cab extension no longer works ? No problem, we have what you need ! CODIMATRA, specialist in the purchase and sale of second-hand spare parts and public works equipment, has selected for you a complete offer of cab articulations compatible with many handling machines. What is the role of a cab joint? An elevated cab provides optimal visibility around the machine. It is an ideal solution when a wide variety of cab heights are required to work. We will find cabins articulated on crawler excavators and wheels for handling work. A wide choice of cabin articulations at CODIMATRA. 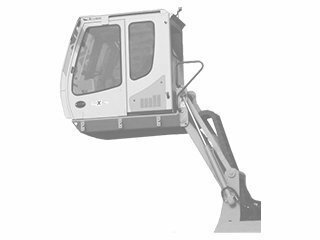 Our dedicated list of cabin articulations is updated daily so that each customer can find the product that perfectly matches their machine. To help you choose the model of cabin articulations you need, call on the expertise and professionalism of CODIMATRA's teams. They are at your entire disposal to answer all your questions or for any other additional information.